MP NEET Counselling 2018: Department of Medical Education (DME), Government of Madhya Pradesh has invited the registration form for the DME MP NEET 2018 Counselling. It has been started from 15 June. After the NEET result declaration, state authority has published the merit list based on the NEET 2018 cutoff. Counselling will be done through online mode only. Candidate who qualified the NEET exam and permanent residents of MP are eligible for counselling procedure conducted by DME, Madhya Pradesh. 85% seats are reserved for the candidates of MP and 15% seats are filled by All India Quota. Approx 900 seats are available in the medical colleges of Madhya Pradesh. 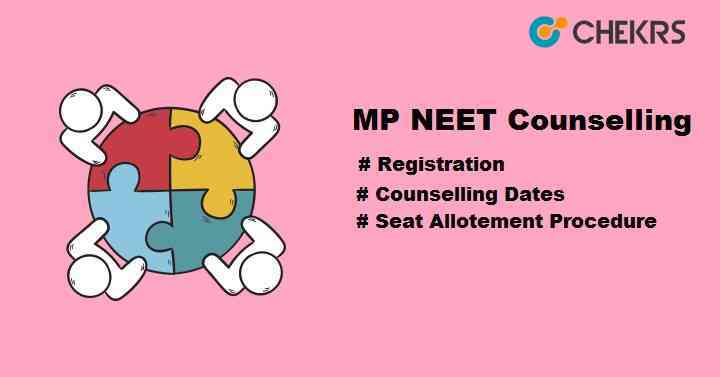 Candidates who want to take part in the MP Counselling have to register on the official site and also compulsory to appear in the NEET 2018 exam. Visit the official website of DME, Madhya Pradesh i.e., mponline.gov.in. Register yourself with your NEET (UG-2018) Roll Number & Secret Key and create profile. After registration, login to the candidate corner and fill the application form for MP NEET Counselling. Candidates will be able to choose their choice of colleges and courses. Fill the choice filling/locking with maximum options. Submit the form with counselling fee. Counselling fee will be Rs.1000/- and can pay through online mode. After some days, seat allotment letter will be released by the authority. Seat will be allotted to the each student applied for the counselling form. After seat allotment, candidates will be called for document verification at the allotted colleges. Candidates have to report at the college campus along with seat allotment letter & required documents. Quota. MP NEET cutoff for residents of MP are decided by DHE, MP. Cutoff will be released separately for both 85 % state quota seats & 15% AIQ. Cutoff is the minimum marks required in NEET exam, considered for admission into government medical & dental colleges of Madhya Pradesh state. MP NEET Merit List will be decided on the basis of marks obtained in the NEET exam. Candidates who applied for counselling form successfully and scored the required minimum marks/percentile in NEET 2018 will be able to attend the MP NEET 2018 Seat Allotment Procedure. The merit list will include the name of candidates who are eligible for counselling. DME MP NEET Merit List will contain the candidates’ name, NEET All India rank, NEET State Rank, category etc.